With a story as mesmerizing as it is chilling, Lady of Hay explores how Jo, a journalist investigating hypnotic regression, plunges into the life of Matilda, Lady of Hay, who lived eight hundred years earlier. As she learns of Matilda's unhappy marriage, her troubled love for Richard de Clare, and the brutal treatment she received from King John, it seems that Jo's past and present are hopelessly entwined. Centuries later, a story of secret passion and unspeakable treachery is about to begin again-and she has no choice but to brave both lives if she wants to shake the iron grip of history. 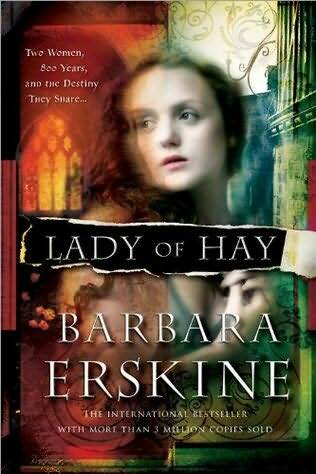 I was instantly drawn to Barbara Erskine’s Lady of Hay because it reminded me of a beloved story by Mary Higgins Clark, "The Anastasia Syndrome," that I read a number of times in my teens. Both stories include reincarnation and a woman’s mysterious (and dangerous) connection to the woman she was in a previous life. Lady of Hay is an enjoyable read, replete with modern day and historical drama, but the ending is disappointing. The moments set in modern times lack the freshness and believability of the historical sections, which sparkle with vibrant details. The characters are interesting, the dialogue at points dry, but the real rub lies in the author’s imposing efforts to be “original” in her ending. The plot follows a predictable love triangle sequence, and the reader will root for the obvious choice, only to be upset when it doesn’t turn out. Unfortunately, Erskine’s efforts to create surprise at the conclusion are just silly. The novel wants to go one way, but it is pushed in a different one. Rather than being surprised, I was grumpy and a little annoyed. Perhaps others have read this book and liked the ending. I would love to hear from you. In my opinion, the novel would have been lovely had the right lovers been allowed to make a go at it, rather than letting evil triumph. This is not necessarily a critical view of the novel, but a personal one. I often get grumpy when novels are not allowed to evolve in their natural way, and this is a perfect example.